I am frequently disappointed by new pancake recipes I try. Some of the typical problems I run across with pancakes are they’re too flat, too hard to flip, they fall apart easily, or just don’t taste that good. So, when I do find a great pancake recipe, you can bet I hang onto it like a precious gem. With all that said, THIS is a fabulous pancake recipe. 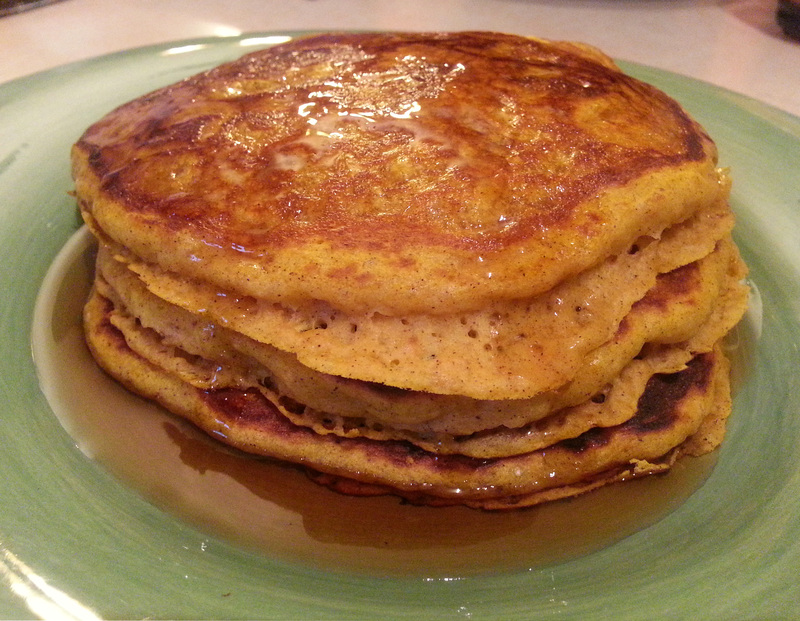 I’ve made these pancakes twice in the last few weeks because they are just so darn delicious. They were gorgeously fluffy and substantial and packed with flavor. A perfect option for breakfast during the holiday season! In a large bowl combine the flour, brown sugar, baking powder, baking soda, allspice, cinnamon, ginger and salt. In a separate bowl, mix together the milk, pumpkin, egg, oil and vinegar. Stir into the flour mixture just enough to combine. Heat a lightly oiled griddle or frying pan over medium-high heat. Pour or scoop the batter onto the griddle, using approximately ¼ cup for each pancake. Brown on both sides and serve hot. 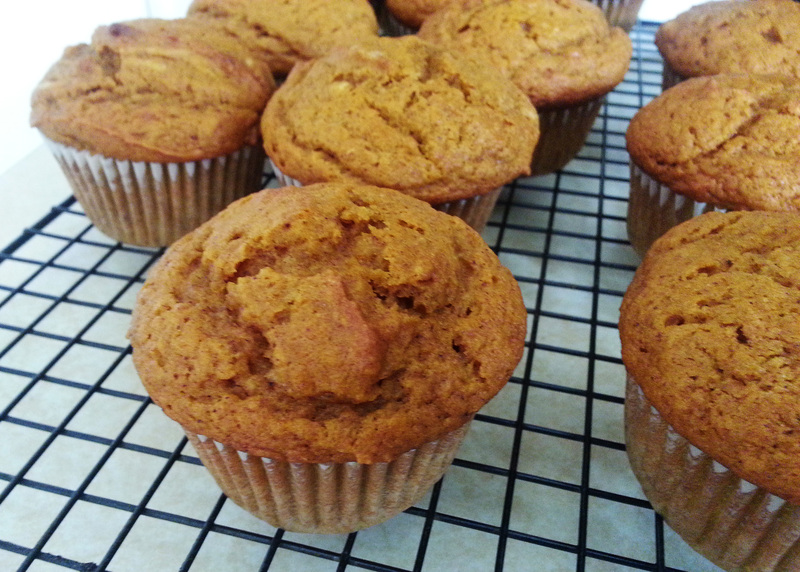 I made these this morning, very skeptical that they would in fact be, the “best ever” pumpkin muffins. I was happy to find that they were literally THE BEST. Seriously so so good. I could have eaten the entire batch. Granted these are not healthy, but, they were incredibly moist, full of flavor, and looked beautiful. This one is definitely a keeper! Preheat the oven to 375°F and prep a standard 12 cup muffin tin with cupcake liners. Combine flour, sugars, baking soda, salt and spices in a medium bowl and whisk together. Set aside. In another bowl, whisk together the eggs, pumpkin puree, coconut oil, and vanilla extract. Pour the wet ingredients into the dry ingredients and stir together. Mix just until ingredients are incorporated. Evenly distribute the batter into each lined cup (an ice cream scoop works well). They will be nearly full. 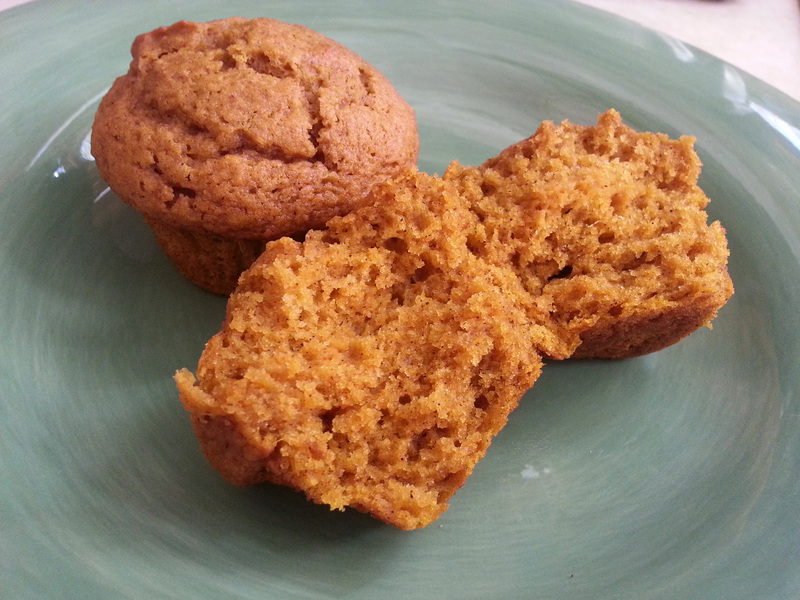 Bake muffins for 20-25 minutes or until a toothpick inserted into the center of a muffin comes out clean. I never thought I’d be one to say I was excited for plum season. Truth be told plums are towards the bottom of my list of favorite fruits. But, after last season, my opinions changed completely. My in-laws have a veritable grove of plum trees and convinced me to take a small box home last year when we went to visit. I was not excited about them. However, I took my mother-in-law’s advice and made a pie out of them. And then my world was changed forever. Cooked plums have got to be the most underrated thing in the world. So sweet, flavorful, and delicious it’s a wonder more people don’t know about them. This year I was pining for plum season and was ecstatic to bring home a large box of plums from my in-laws to fill up my freezer for year-round treats. 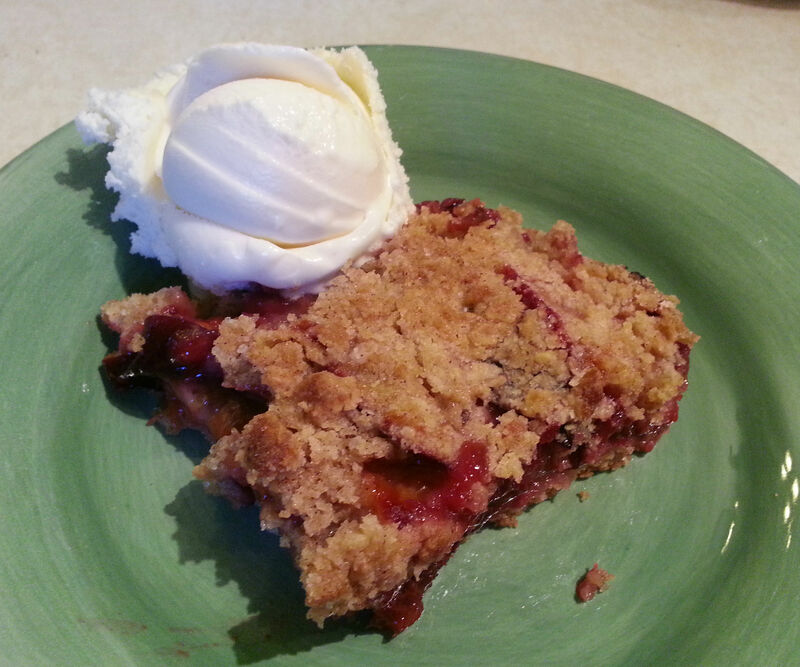 I found a couple amazing recipes last year that I loved, namely Perfect Plum Pie and Plum Pocket Pies. These crumble bars are my latest find and may very well be my favorite of the three recipes. It’s so easy to make and turns out so beautiful. If you decide to make it for yourself, don’t be alarmed at the dry nature of the crust/crumble mixture. It will magically change from a dry floury looking mess to golden buttery crusty deliciousness. Oh and don’t forget the vanilla ice cream! 1. Preheat oven to 375°F and grease a 9 x 13″ pan. 2. Toss plum slices with the 2 Tbsp. sugar and 1 Tbsp. cornstarch and set aside. 3. In a large bowl (or the bowl of your food processor) whisk together the brown and white sugar, baking powder, flour, spices, and salt. Cut butter into approximately 1 Tbsp. size chunks and add to flour mixture. Using a fork, pastry cutter, or your hands, work the butter into the flour mixture until it becomes crumbly (or pulse a few times in the food processor). Then stir in the egg. The mixture will be very dry and crumbly. 4. Firmly press two thirds of the crumble mixture into the bottom of the 9 x 13 pan. Then evenly layer the plum slices on top. Sprinkle the remaining crumble on top and bake for about 40 minutes or until the topping has turned golden and the fruit is bubbling. 5. Remove from the oven and allow to cool before slicing and serving. I decided this year I would try my hand at canning some salsa. Being a rookie to the whole process I went to my canning guru sister, Annie for advice. She suggested this recipe because it’s her go-to and isn’t too sweet. Made as-is it produced a very mild salsa, despite using a full cup of chopped jalapenos and about half of the removed seeds. It mellowed out quite a bit after it was canned. If you want a spicier salsa I’d add an additional 2-3 jalapenos and more seeds. 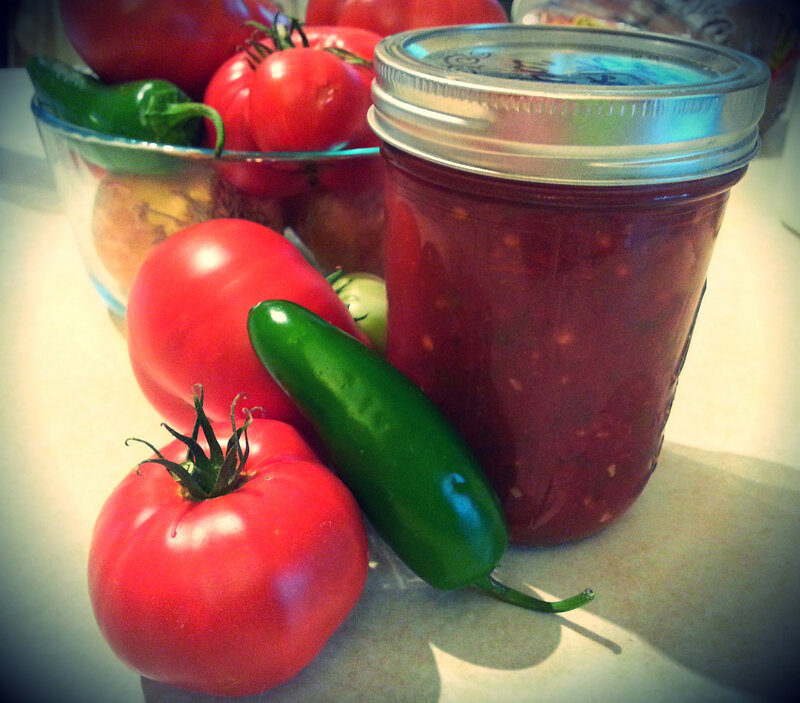 If you won’t be canning the salsa, the recipe should be plenty spicy with just 1 cup of jalapenos. The original recipe calls for 1/3 cup of sugar, but I left that out as my garden fresh tomatoes were plenty sweet on their own. If your tomatoes aren’t very ripe or sweet, you may want to add it back in. I am also going to omit the instructions on how to actually can the salsa. There are just too many different factors that go into the process depending on where you live and what method you use. I suggest looking up your local Extension Office to get the proper information for your area (in addition to referring to your user manual for your canning equipment). If you would like a smoother salsa, you may use a food processor to further chop your veggies. I found it worked best to process the onions & peppers together to a finer mince, then process the tomatoes separately and leave them a bit chunkier. Just be sure to chop your veggies into a small/medium uniform dice before processing to ensure evenly sized pieces. Mix all ingredients together in a large pot and bring to a slow boil for 10 minutes. Can per hot pack method for your equipment and locale. Several years ago my not yet sister-in-law, Rachel brought the most fabulous rolls ever to a family dinner. I cannot tell you how amazing they were. Delightfully light, but with substance and just a hint of sweetness. I knew I needed the recipe. So, although I did not know Rachel very well yet and felt like a huge dork doing so, I asked her for the recipe. And to my utter delight and eternal happiness, she gave it to me. My life has never been the same. I’m telling you these are the best rolls in the world not only because they taste so darn delicious, but because someone like me who guesses her way through every bread making endeavor, can make a perfect batch of rolls every time. Oh and just in case you’re curious, this recipe came from a lady at Rachel’s church named Doreen. Thank you Doreen and thank you Rachel. You and your rolls are beautiful angels from heaven. Combine yeast, water, and a little of the sugar in a small bowl. Mix sugar, milk, eggs, butter, and salt in a large bowl. After yeast has proofed a little, add to milk mixture. Gradually add flour until a soft but not-too-sticky dough has formed. Knead 6-7 minutes. Let dough rise in buttered bowl until doubled in size. Punch dough down and divide into three balls. Roll out each ball into a flat circle and cut into 8 triangles to make crescent-style rolls. Let them rise again, about 40 minutes. 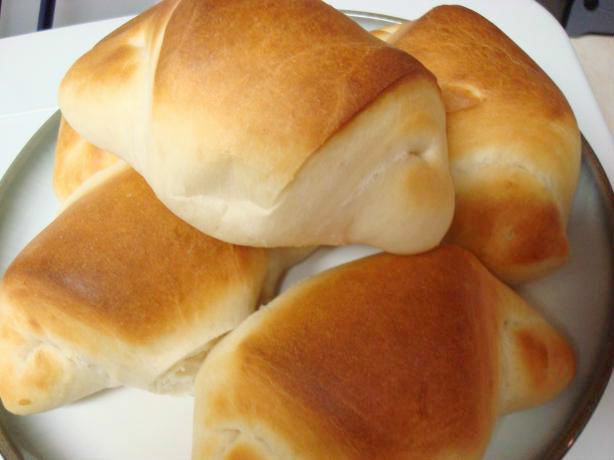 Bake at 400°F for approximately 12 minutes (or until golden brown), depending on the size of the rolls. I saw this recipe the other day and thought it would be a nice change for a weekend breakfast. They were super easy to make and everyone scarfed them down. I’d planned on having some as leftovers for a couple of days but there weren’t any left! Guess next time I’ll be making a double batch! Mix together spinach, ricotta, sour cream, and cheeses. In another bowl, whisk together eggs, milk, hot sauce, cumin, salt, pepper, and lemon pepper. Add the egg mixture to the spinach mixture. Spray a muffin tin liberally with cooking spray. Evenly divide the mixture into the muffin tins. Bake for 20 to 25 minutes or until eggs are set and beginning to brown. 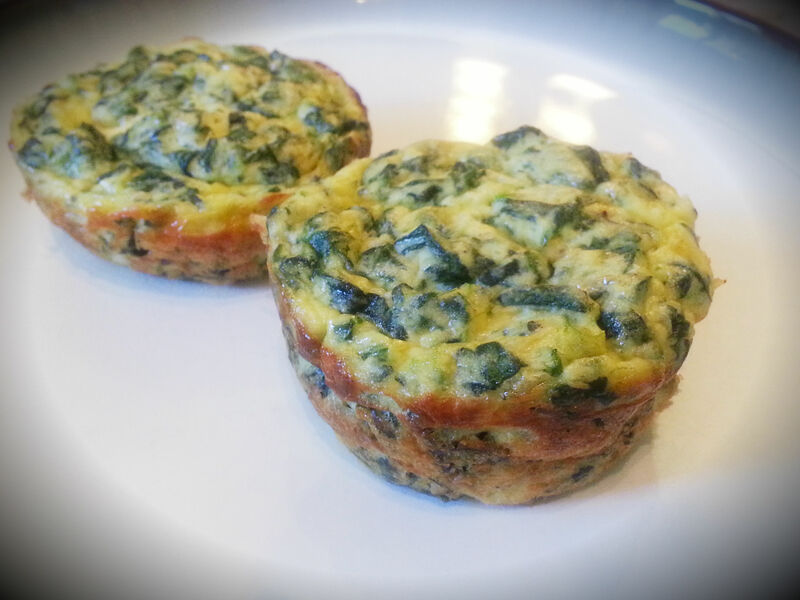 Allow to cool for 5 minutes, then remove from muffin tins. Serve with more Parmesan cheese if desired. Sometimes you just want to have some good old comfort food. 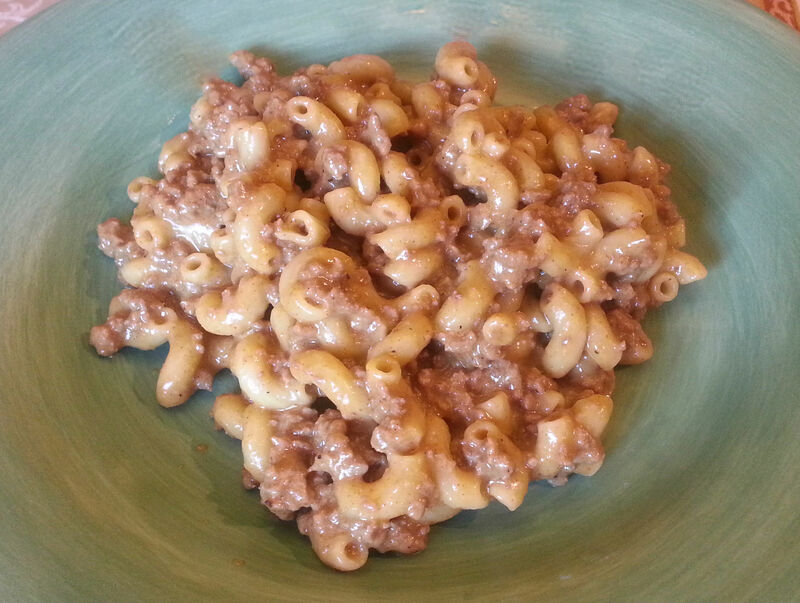 For most Americans, Hamburger Helper is/was a common staple at dinner time. Only problem is, it’s full of so much salt and additives that you can’t help but feel a little guilty eating it. This is a homemade version that gets rid of all that yucky junk you don’t need and leaves you with only the yummy cheeseburger goodness you want. Brown ground beef in a deep pan or pot (you’ll be adding a lot of liquid). Drain the fat. Add spices, sugar, hot water, milk, & pasta and bring to a boil. Reduce heat to a simmer and allow to cook until the pasta is tender. Add cheddar cheese and turn off the heat. Stir until the cheese is melted.